Indoor climbing is a rock climbing activity done on artificial structures. 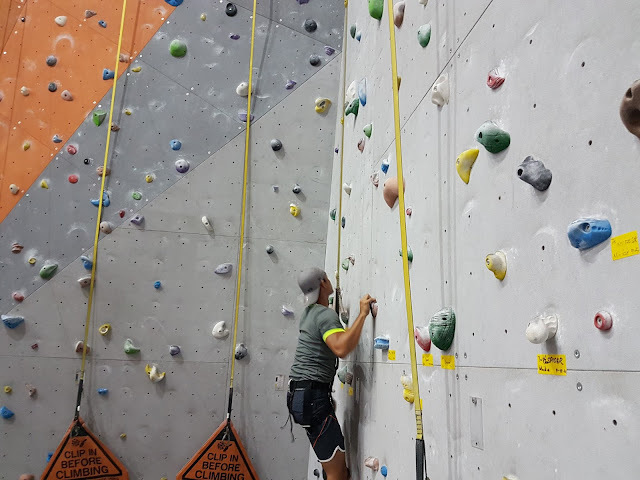 The climbing walls are usually constructed of brick, steel or wood, with shaped grips, called climbing holds, attached to the wall. Belaying devices, which are designed to prevent climbers from falling, are attached at various points on top of the wall. Specialized shoes are recommended for climbing, and climber may use powdered chalk to prevent sweaty hands and fingers. Wall climbing, as it is also known, is a new sport for me, so I am still a noob for this. I've tried it once during my PE college but that was too long ago I forgot all about it. I was recently reintroduced to it and so far I've done it on two sites in Metro Manila. I will add to the list below as I try the other sites.